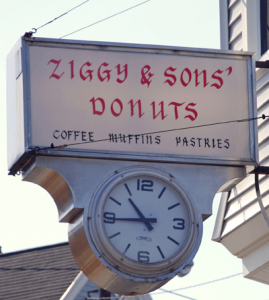 We had some business to attend to in Salem this morning, so decided on a whim to pop into Ziggy’s Donuts on the corner of Essex and Webb Streets for a mid-morning treat. Ziggy’s, which has been owned and operated by the same family since 1964, is a tiny storefront that’s almost lost on the residential street, giving you the feeling you are walking into someone’s home. A cramped space with regulars chatting at the counter, along with bunches of photos and articles stuck to the fridge, compound that feeling—but don’t let it scare you off. We visited later in the morning, (they open at 6:30) so selection wasn’t huge, but inviting nonetheless. One of our choices was an all-time favorite, the traditional jelly stick. Wow. 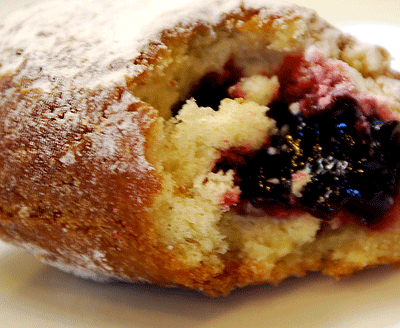 This is what a doughnut should be: that almost-crisp crunch on the outside and light moist cake on the inside. It was incredibly fresh tasting and delightful. Not at all like those leaden things served up by chain bakeries that you can feel sitting in your stomach all day. We also tried the coconut, which was excellent, and the coffee roll, which was surprisingly light and not overwhelmed by the glaze. Everything we tasted had a great balance of flavor—none of that fryer-oil aftertaste and just the right amount of sweetness. So next time you’re up early looking for sinkers to accompany your joe and morning paper, stop in to Ziggy’s and try their hand-made wonders. We’ll be right behind you in line.